It is the garden brought closest to our hearts. A fistful of bliss, dunked in water from the waist down. The question is: How best to tend to the cut flowers that we bring home? 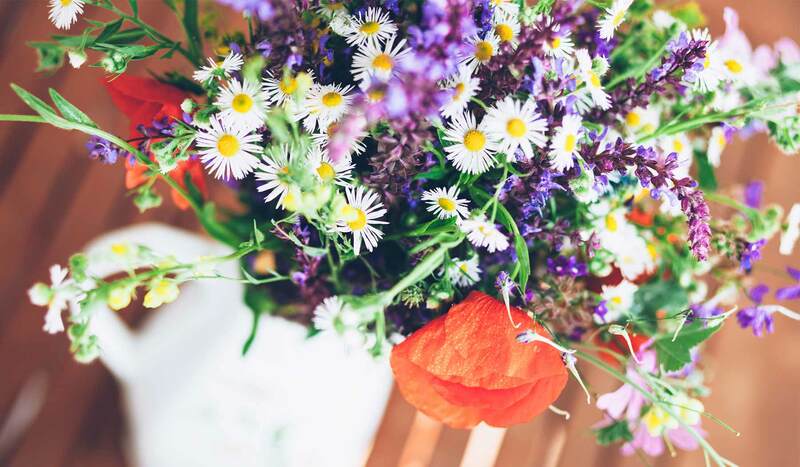 Tired of watching daisies wilt before their time, sick of plugging our nose as we pour out putrid murky waters and the stems and leaves that have gone all goopy, we sought advice from top-notch florists and horticulturists around the globe. Here are a few pointers to get the most bang from your bouquets. Keep it clean: Gunk-free buckets, pruners, and water will reduce the bacteria that clog stems and hasten rotting. That handy little packet the florist hands you is designed to destroy the bacteria, writes Suzy Bales, author of Garden Bouquets and Be­yond (Rodale, $35). We found this DIY recipe at chemistry.about.com: In a quart of warm water, combine 2 tablespoons each white vinegar and sugar and 1/2 teaspoon household chlorine bleach. Ditch the scissors: Use a sharp knife or garden shears. Scissors merely squeeze and crush stems and set you back before you get the posies to water. Cut on the angle: You might think this boosts the water uptake, but really it keeps the stems from resting flat against the bottom of a vase and blocking the entry point for water, says Johannes Maree, coauthor of Cut Flowers of the World: A Complete Reference for Growers and Florists (Timber Press, $39.95). By cutting off the bottom inch or two, you remove the natural seal that formed when the stem was first cut. This also removes any bacteria that could block the ends, and it eliminates air bubbles that can form when a stem is first snipped. Short is good: Shorter stems allow water to get to the bloom more quickly and easily. Lose the leaves: You want the energy surging to the bloom, don’t you? So don’t provide a detour into the leaves. And don’t think of having any foliage under water, where it will swiftly break down and turn to goo. Cut the heat: Room-temperature tap water – not lukewarm, not chilly – is the happiest bath for most bouquets. Condition: Many pros dip fresh-cut stems in a conditioner such as Floralife Quick Dip (find it at floralife.com), an instant pretreatment hydration solution. (The exception: Pretreatments should never be used on stems cut from bulbs.) Also, use the pouch of floral preservative that came with your flowers. Bales says that storing fresh-cut flowers for six hours in a cool corner of the basement can triple the vase life. Ditch the swap water: OK, sometimes it’s a pain to airlift a big bouquet and change the water. Sam McGee, of Prufrock Floral & Botanical Design in Winnetka, Ill., shares this trick: Instead of budging the flowers from the vase, hold the vessel under a running faucet for about five minutes. As the water spills from the vase, you are essentially changing the water without moving a bloom. Once it’s crystal clear, you are back in business. « Previous Post: Why Are Hydrangeas Different Colors?